Lance Mackey is currently running in 12th place on the Yukon Quest trail. He is the winningest musher in Yukon Quest history. The four-time champion is a cancer survivor and both his public and private life hasn’t always been positive. The lifelong musher knows he can’t run dogs the way he used to, but he may never be ready to hang up the harnesses. In the 2013 Yukon Quest, Lance Mackey made it is far as Pelly Crossing. That year, the weather was too warm for his young dog team, they were sick and he decided to scratch. This year, conditions are nearly the opposite and Mackey is determined to cross the finish line. But many of Mackey’s competitors and some of his fans have voiced concerns about whether he can handle extreme cold, exposure and tough trail. Even he says his body isn’t holding up the way it used to. “I don’t know what my future holds in these long distance races, but it looks like it’s going to be more challenging and that’s going to give me more satisfaction if I get to the end of this thing,” Mackey said. For Mackey, ‘retirement’ may be a four-letter word. But he does say his priorities in racing have changed. “I did my time, I achieved my goals and now its just about being in this sport as long as possible because I do love it and don’t know what the hell else I would do,” he said. 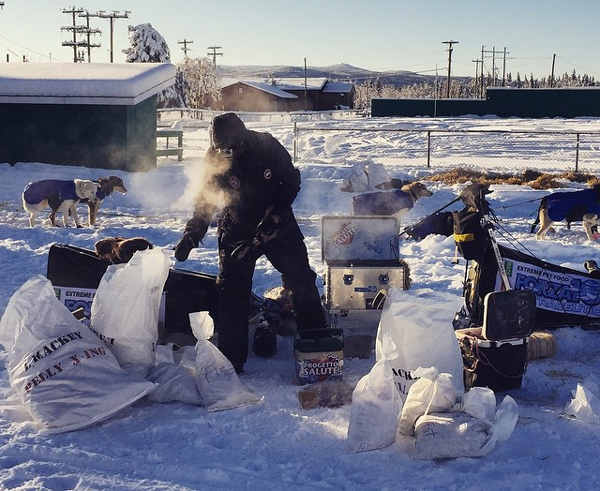 This is Mackey’s seventh Yukon Quest. He’s never finished lower than third place. Regardless of where he finishes this year, he says his dogs are still up front. Mackey’s Comeback Kennel legacy began with a dog named Zorro, who finished the Quest as yearling back in 2001. Mackey himself is still on the runners, driving teams from that line. And with more than 500 miles of trail ahead the former champion still has plenty of opportunity to claim a spot in the top-10.